Planning for travel can be difficult when you’re vegetarian and/or vegan — whether you’re flying all day without many (let alone delicious) options, or unexpectedly stuck in an airport during a delay. 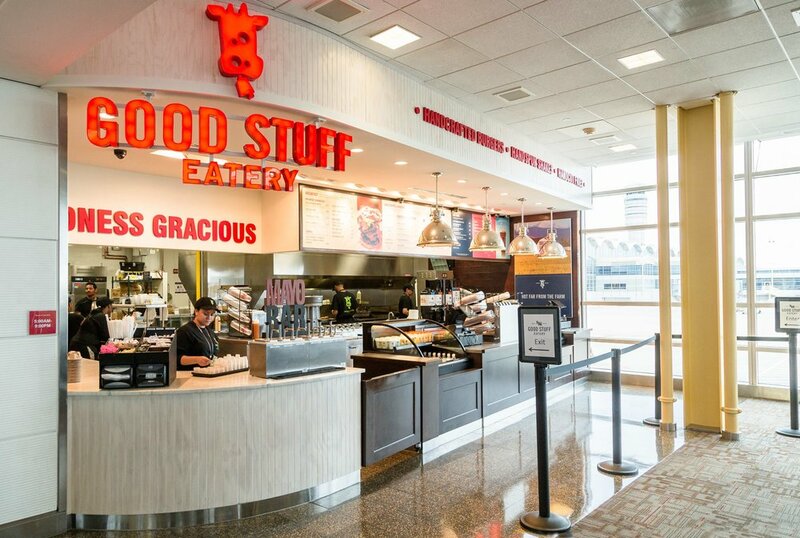 Luckily, more and more airports are stepping up to the plate and offering amazing, nutritious options — Reagan National, in particular, has some stand-out eateries. Check out our favorite tasty vegetarian dishes at Reagan National below! 1) Matsutake Sushi – National Hall: This full-service Japanese restaurant is conveniently located pre-security — so whether you arrive with some time to kill or are getting a meal to go, it’s a great, quick option. With tons of noodle options — we love the Kitsune Udon Noodle Bowl (thick noodle soup topped with fried tofu and veggies) and the Tofu Teriyaki, especially — you’ll fill up on a savory meal before your flight. 2) Good Stuff Eatery – Terminal B: While Spike Mendelsohn’s Capitol Hill eatery is known for its juicy, delectable burgers, his vegetarian options do not disappoint — and pack a seriously savory punch. Meet Good Stuff Eatery’s Fried Green Tomato Sandwich: With fresh ruby red tomatoes, sliced avocado, creamy goat cheese and peppery arugula, this thick, juicy sandwich is beyond satisfying. Plus, if you’re flying before 10 a.m., The Goodstart breakfast sandwich is not to be missed — featuring a farm-fresh fried egg, American cheese, avocado and a ruby red tomato. Make it a combo, and you’ll also get a cup of hot coffee, and Sunny’s Homefry & Onions! 3) Kapnos Taverna – Terminal C: Local chef Mike Isabella rolled out yet another hit with this Mediterranean concept! The Garden Mezze menu is a smorgasbord of vegetarian delights: Spanokopita with flaky phyllo and creamy feta, Fried Greek Potatoes with orange and Greek Island Sauce, Roasted Spiced Cauliflower with golden raisin and fresno chili, oh my! Plus, don’t miss the famous Crispy Brussels Sprouts with burnt coriander honey and spiced almonds. Who needs meat? Mark your calendar and save the date, @kapnostaverna #CollegePark opens its doors on Monday, September 25 at 5pm. 4) Ben’s Chili Bowl – National Hall: While Ben’s Chili Bowl got famous for its chili and half-smokes, Ben’s vegetarian options don’t disappoint! Found in 1958 in D.C.’s U Street Corridor, Ben’s Chili Bowl is one of D.C.’s core eatery institutions — come soak up all the delicious vegetarian options, with a Veggie Burger, Veggie Chili Cheese Fries or Ben’s Salad Bowl. You can even sub a veggie burger on any breakfast sandwich! 5) &pizza – Terminal C : This revolutionary new make-your-own pizza place has tons of vegetarian — and even vegan — options to choose from! The menu makes it simple to see which ingredients are right for certain food restrictions, including gluten-free options. With amazing options like Vegan Cheese and Vegan Beef, even the most specific needs can be deliciously accommodated here! Don’t sacrifice quality while traveling — plan to swing by these high-quality eateries for a tasty vegetarian meal that will fill you up for take-off! This content is sponsored by the concessions of Reagan National Airport.